You are here: Home / Increase IP value / 34% Pricing Premium and 41% Better Chance of a Sale. Selling a Patent With or Without Claim Charts? 34% Pricing Premium and 41% Better Chance of a Sale. Selling a Patent With or Without Claim Charts? We regularly hear from our corporate patent buying clients that they do not look at the claim charts provided by the sellers. Creating claim charts is expensive and time-consuming. If buyers are not looking at them, why prepare them? Our data says the story is not that simple; where claim charts are included, asking prices are 34% higher, and sales rates are 41% better. We believe that buyers are using the claim charts as guideposts to help them make their buying decisions. 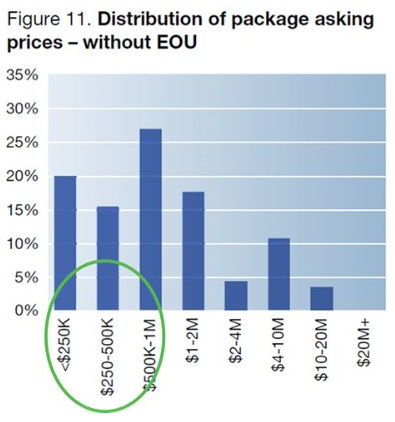 Evidence of Use (EOU) is a more accurate description of what seller’s typically mean when they supply claim charts with the patent sales packages. An EOU identifies the important patent, specific claim, key market and target products, and elements of the infringed claim. Although typical EOUs show many of the claim elements, there may be assumptions built into the EOUs. The assumptions often relate to some aspect of how the target product works and how the claim maps to the product. With the seller’s EOU, a buyer can quickly categorize a buying opportunity by technology and better understand how the seller believes their patents are relevant to the market. This information helps the buyer focus on the value drivers. That said, we create our own EOUs and recommend that our buyers use these EOUs when making their buy decision. What’s the Impact of an EOU? In our latest paper on the patent market, “The Brokered Market in 2015 – Driving Off a Cliff or Just a Detour,” we looked at over 566 patent packages with over 6,000 patent assets. Patent packages with EOUs make up about 1/3 of the market. 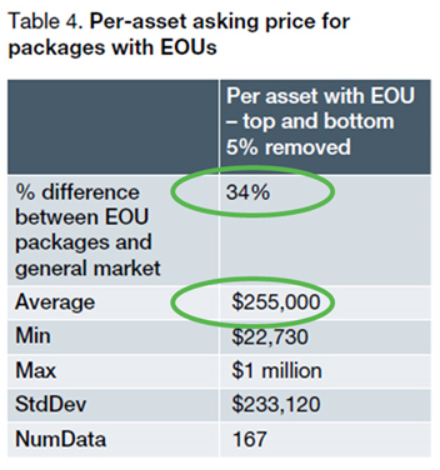 The asking price of patents with EOUs is about 34% above (~$60K higher) than that of patents in packages without EOUs. 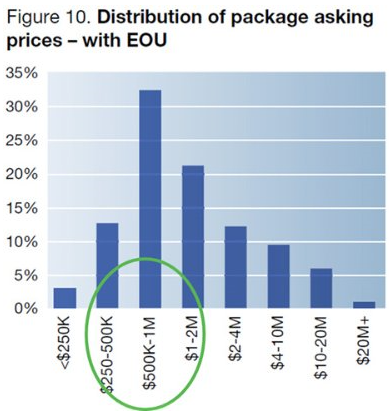 Figures 10 and 11 show more packages fall into higher price ranges when sellers include EOUs. Additionally, packages with EOUs sell 41% better than the average market sales rate (the % of patent packages that sell). With the increased asking prices and the better chance of sales, EOUs are a good investment for the patent seller. Look for our paper in issue #75 of IAM Magazine. You can download our other papers on past years’ patent markets, analysis of Intellectual Ventures, and other topics at http://www.richardsonoliver.com/news.